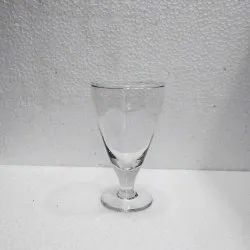 These decorative wine glasses will definitely catch the sight of your guests and make unique addition to your home decor. Nothing enhances better the table setting as a pair of astonishing crystal stems. These are high qualtiy 2 piece stem glass having 150 ml. capacity. They are made of virgin food grade material. Product Desc : 80 ml. We are engaged in offering excellent quality Brass Stem Glass to our valuable clients. This glass Set will be a jewel in your bar Feel the royal difference. The Drinks will be more refreshing and shooting in these glasses. These glasses are also best for Gifting the host will cherish it for lifetime. Clients can avail from us this range of Brass Stem Glass at most affordable prices. High Quality Glasses available in different sizes and shapes.